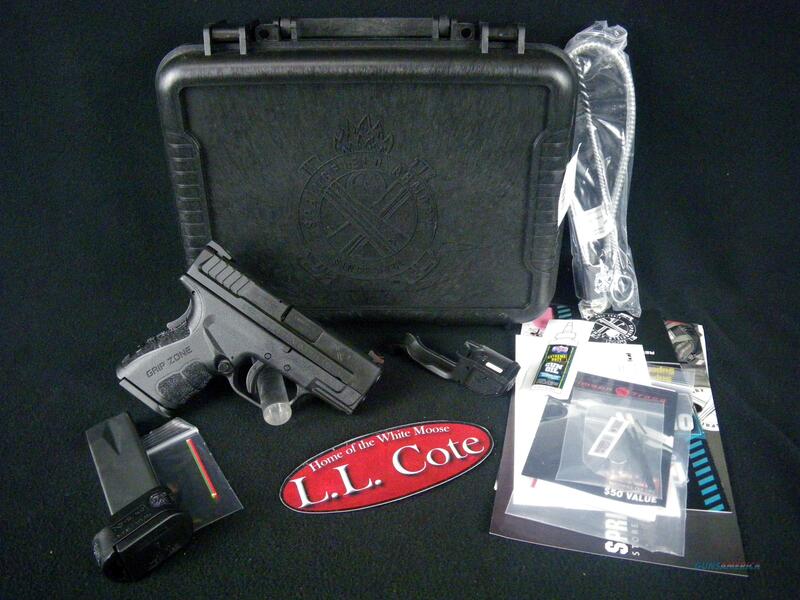 Description: You are bidding on a Springfield XD-9 Mod.2 Sub-Compact Crimson Trace in 9mm with a 3" barrel. Springfield Armory®, the same company that brought Point & Shoot Ergonomics™ to the market in 2001 is proud to announce the latest evolution of the polymer pistol – The XD® Mod.2® Sub-Compact in 9mm and .40SW. Put an XD® Mod.2® in your hand, and you’ll feel the difference. Equipped with the GripZone®, the XD® Mod.2® Sub-Compact applies ergonomic science to every surface that touches your hand. Enter the GripZone®: a set of frame features working in unison to optimize interaction between the human hand and the pistol. Within the GripZone®, there are three distinct textures, each engineered for a specific purpose. The GripZone® doesn’t stop with new grip textures. The re-contoured, slimmer frame and slide add up to a far more natural grip feel that has nearly twice the magazine capacity and is only 2 tenths of an inch thicker than single stack conceal carry models. The High-Hand™ grip relief and High-Hand™ beavertail enable the hand to be positioned as high as possible toward the barrel bore thereby greatly reducing the pistol’s felt recoil. The no-snag trigger guard minimizes possible unintended contact with a holster or clothing. All of these GripZone® advantages are ergonomic features that you will truly feel. It all adds up to a pistol that naturally and comfortably stays positioned in your hand. If you are looking for the best solution to shooting comfort, concealability and increased magazine capacity, you’ll want to pick up the new XD® Mod.2® Sub-Compact. Displayed images are stock photos. Any questions please feel free to ask (our phone number is in the additional information tab above).